SKU: N/A. Tags: Cannabis Oil Cartridges, Golden Goat Pax Era, Golden Goat Pax Era Pod, Pure Vape Oil Cartridges. What is a Golden Goat Pax Era Pod? Golden Goat is a popular medical marijuana strain with a myriad of therapeutic uses. Infused by Bloom Farms into its range of Pax Era Pods, it offers smooth, incredibly potent, deliciously zesty clouds the envy of all. Testing at over 80 percent in a 500-milligram cartridge, THC levels are insanely high. It is also rich in CBD and other cannabinoids, as well as healthy terpenes and flavonoids for optimal healing. Effects are slow to come, but when they do, you notice it immediately. Golden Goat is famous for easing in slowly and transitioning smoothly from head to body. As a hybrid strain, its effects balance beautifully, with enough Sativa to enjoy it during the daytime, and enough Indica to put you quietly to sleep afterward. Golden Goat is happy, creative, focused, and sleepy all in one delightful vaping oil. Since Golden Goat is a cross between Hawaiian-Romulan and Island Sweet Skunk, its Sativa genes typically dominate. With an incredibly high concentration of CBD too, this strain is popular for treating a horde of common complaints, from pain to appetite issues, inflammation, muscle tension, nausea, vomiting, anxiety, depression, concentration issues, attention disorders, and much more. 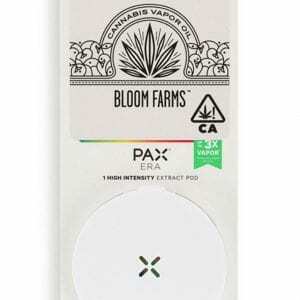 Patients get the most benefit out of Bloom Farms’ Pax Era Pods, but because of its tastiness, smooth draw, potency, and wonderfully full-body effects, it is popular among recreational users too. Worry free, 100% without anxiety and in total bliss!! !